Anyoption is one of the oldest binary options brokers and is the second one to be granted a license by CySEC – the broker is also registered with the Financial Conduct Authority in the UK. Anyoption is also the second broker to introduce the digital currency Bitcoin to their list of tradable assets, following popular demand. Anyoption have a clear idea of what binary options trading should be, and they deliver that impeccably through the easy-to-use anyoption platform, rich set of tools, and rebates of up to 20%. Investors trading with this broker have the choice of two anyoption account types. The standard anyoption account comes at a minimum deposit of $200 and is perfect for beginners who wish to improve as traders or for intermediate traders who want to test the anyoption platform and the site’s general features. The VIP anyoption account is for traders who make deposits of $5,000 or above. The additional exclusive features which come with this account need to be discussed with an anyoption representative. Both anyoption account types benefit from a variety of features including educational material, access to an account manager, rebates of up to 20%, and full access to the bespoke anyoption platform. The anyoption platform is in-house developed and offers various trading types to the anyoption account holders. Anyoption’s main philosophy is to make trading easy and professional, and this comes out primarily through its trading platform which has a unique user-friendly design. With 5 different trading types to choose from, traders are spoilt for choice. www.anyoption.com guarantees a 15% refund in case of a losing trade. The Binary Options feature is akin to the classic High/Low binary options trading feature. The layout contains four boxes, making it particularly attractive for traders who wish to place multiple trades at once. The Option+ platform is an extremely useful tool which allows anyoption account holders to sell their options before the expiry time in order to minimize losses in the event of an expected losing position. The Binary 0-100 platform is unique and was designed for fast-track anyoption account holders who want to generate a higher percentage of profits up to 10 or more times the investment size. The One Touch anyoption platform, which is common among other brokers, can be executed between Friday’s after-trading hours and Sunday evening – every weekend. The platform has a lovely layout which makes it easy for any trader to use. The Special platform allows anyoption account users to trade on Bitcoin and Alibaba assets. Anyoption’s education center contains an extensive collection of trading guides, videos for beginners and advanced traders, an eBook, product tutorials, and educational articles. Anyoption’s customer support team is available from Monday 08.00 until 00.00 GMT from Monday to Friday, 24 hours a day. They can be reached by email, live chat, and phone. Clients can even request a call back directly through the company’s website. 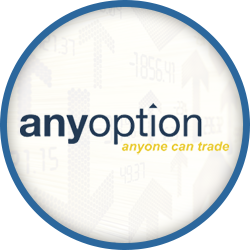 www.anyoption.com is a binary options broker that undoubtedly means business. Their platform is second-to-none, their educational features are extremely useful even for advanced traders, and their trading features such as the Trend Tool or Live Feature are great tools for any trader to have. They are innovative, straight to the point, and you really get the impression that they will not settle for second best.